Leading off today: Johnny Malandruccolo is sitting for the moment at 99 career goals for the Auburn boys ice hockey team. How he got to that point is pretty impressive. Malandruccolo did all of his team's scoring Tuesday in a 6-3 victory over Cicero-North Syracuse. The senior scored four times in the third period to erase a one-goal deficit and then put the Maroons safely ahead. "Johnny's got the skill-set, that if he's got the time and space, he's going to bury it," coach Mike Lowe said of the fifth-year varsity player. "It's hard for Johnny to get space because most people know him and are aware of him. He's always had the desire to be good. ... Like most student-athletes, he's developed physically over the years. He's developed more than most student-athletes because he wants it. He definitely works for it." Ty Hlywa contributed three assists to the victory. More Tuesday action: Thomas Jefferson guard Kareem Welch is a handful to contain. If you need proof, refer to Tuesday's PSAL contest vs. Eagle Academy II. Welch dropped 50 points and added six assists as Jefferson scored a 123-77 rout. The voters speak: Voters in the Greece Central School District overwhelmingly approved a $107.8 million capital improvements package that will result in significant upgrades to the athletic fields at all four high schools. The measure passed by a vote of 2,836 to 653. Most construction would likely begin in 2021, with a target completion date in 2025. All four high schools will get synthetic turf fields and lights for the first time. Observation: The improvements to the outdoor fields in Greece were at least a decade overdue for one of the largest suburban districts in the state. I think I still have sneakers with caked-on mud from the quagmires while covering Greece Athena home football games in 1986. Milestone ahead: Wednesday's game against S.S. Seward will be the 1,000th coached by Fred Ahart of Roscoe. Ahart's only job has been Roscoe's AD along with boys basketball coach and football coach since graduating Ithaca College in 1969. Ahart, whose team is 1-1 this season, is 470-529 in basketball. A long time coming: It took awhile -- 71 tries to be exact -- but Waggener High finally defeated Ballard High in Kentucky scholastic basketball. J.J. Kalakon scored 28 points to lead the Wildcats to an 80-74 victory over Ballard, began playing basketball in 1970 and had posted a 70-0 record against Waggener before Tuesday's contest. Waggener improved to 4-0 for the season. Column lambastes Sec. 5: Nate Rider of The Daily News took some hard swings at Section 5 in a column this week over the decision to move the Batavia Notre Dame girls basketball team from Class C-1 to B-1 following an 18-7 record a season ago. The team played in Class D-1 two seasons ago. "The Fighting Irish are a talented team, without a doubt, but to be put in a class that has the likes of Batavia, Pal-Mac, Livonia and Newark, they don't stand a chance," Rider wrote. "And that's exactly how Section 5 wants it. You are not transparent. But your petty qualms are ridiculous." Notre Dame has been successful. but it's not like the team has steamrolled the competition of late. 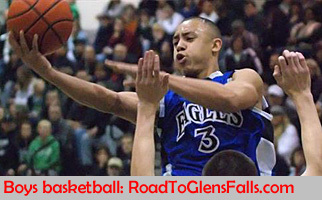 Seven of 15 games against Class D opponents in 2016-17 were decided by 10 or fewer points, including a pair of losses in a 19-7 season that ended with a loss in the state quarterfinals. Last season, eight of 13 contests against Class C competition ended in wins by 10 points or less or losses. The Fighting Irish finished 18-7 and fell one game short of returning to the state tourney. The combination of a full league schedule and the late decision a month ago by the section's classification to move the Fighting Irish up again, left Notre Dame no chance of scheduling the sort of competition that might actually prepare them for the sectional Class B tournament in February; there are only three Class B but six Class D contests on the schedule. "Section 5 has a problem and it is Section 5," Rider wrote. "They don't want to deal the issue of private schools so under pressure from the publics they will cave every year and continue to punish high school girls who have no fight in the game. ... If you want the private schools out of the public school tourna- ments, do something about it. Don't hide behind your insecure notions." Commentary: I'm not completely onboard with what Rider wrote, but this wasn't a case of writing from the ready-fire-aim school of commentary. He raised some valid concerns, and one of the folks who helps me with Section 5 insight from time to time accused the classification committee of having "lost its moral compass." I've said before that the classification committee has a tough job in no small part because they've been handed some questionable guidance on what their criteria should be. (1) They have to quit making their decisions so close to the start of the season. There's no reason that they couldn't ask private and charter schools to provide a list of their new transfer students by Sept. 15 and then meet a week later to determine the potential impact of those players. (2) Factoring a team's scheduling decisions into the equation -- as often happens -- when determining classification assignments is asinine. If a school chooses to play non-leaguers against larger schools as a means towards getting better, then so be it. It's an option readily available to every public school in the section and should have no bearing whatsoever on the classification process.